Announcement mommysmoon is closed for an overdue overhaul. Will be back online when overhaul is complete. All orders receive a thank you coupon - 25% off your next order of $25.00 or more. I enjoy doing custom orders and will work closely with you to ensure you get the piece you envision. If you see something and want changes, let me know. I will also make items at different phases of the moon on request. mommysmoon is closed for an overdue overhaul. Will be back online when overhaul is complete. Amethyst Dreams a Crochet Rope Necklace with Amethyst Accents and Josephine Knot Can you see Lady Mary Wearing This? 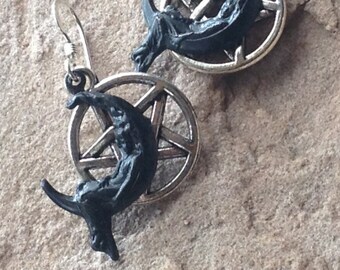 The photo below is of the earring that I sent to Tracy to match. She hit the nail right on the head! She goes way out of her way to satisfy her customers. She searched for the beads, etc. tirelessly until she found matches. Believe me when I say She will definitely be receiving more of my business! I LOVE this Bracelet. One of my favorite things I own. The owner is a real sweetheart & she did a fabulous job on the specially made crystal pendulum for me. She put her heart & soul into it & delivery was supberb. I would definitely do business with her again. I also love the name of her shop "MOMMY'S MOON". This is the item that got mommysmoon on Etsy. It's grown from there. Copper Dragon Nekclace - Full wing spread. Is my work table always this neat? Hardly ever…..it is, however, how I’d like for it to be. However, I’ve found creation is chaos and chaos creates inspiration and this is where some of my favorite designs are born. And when you are motivated, inspirated….well, order isn’t high on the list of priorities! In fact, I’d rather be creating than just about anything…promoting my items or even posting them. mommysmoon has been on Etsy since 2008, but it existed in my mind for years before the shop started on Etsy. My daughters coined the phrase when they were 3-4 years old. 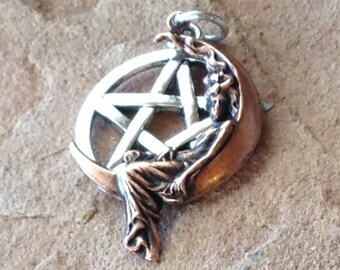 Being pagan and specifically Wiccan, I tend to go barefoot and wear celestial, magical jewelry. My daughters caught onto the connection between the moon jewelry and the moon in the sky and it became mommy’s moon. When I began making jewelry, it was naturally Celestial and Goddess themed, mommysmoon was the perfect name for the shop. Over the years, my designs have changed & expanded, but they still reflect the energies that work with me. As the years pass my beading has gotten more complex and beautiful. It’s gone from simple stringing, to peyote stitch, to crochet ropes and I’ve learned to combine more than one technique and that has ended up with the beautiful dragon designs. Each design is more exciting than the last for me. I hope you will agree. The Meeser Mafia is my quality control crew, assist in setting up photography and are occasional Models as well.